For the community formerly with this name, see Edwards, California. 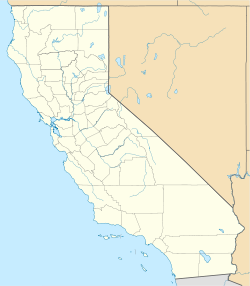 Muroc (also, Rogers, Rod, Yucca, and Rodriguez) is a former settlement in Kern County, California in the Mojave Desert. It was located on Rogers Dry Lake 3 miles (4.8 km) east of Edwards, at an elevation of 2283 feet (696 m). Muroc still appeared on maps as of 1942. Muroc's site is now on Edwards Air Force Base. A post office operated at Muroc from 1910 to 1951. The name honors early settlers Ralph and Clifford Corum — their surname spelled backwards is "Muroc". ^ a b c d e Durham, David L. (1998). California's Geographic Names: A Gazetteer of Historic and Modern Names of the State. Clovis, Calif.: Word Dancer Press. p. 1079. ISBN 1-884995-14-4. This page was last edited on 7 June 2017, at 22:38 (UTC).